Car camping is tied with RVing as America’s favorite way to road trip across the country. You’ve got the freedom of the open road without the expense of hotel rooms and restaurants. 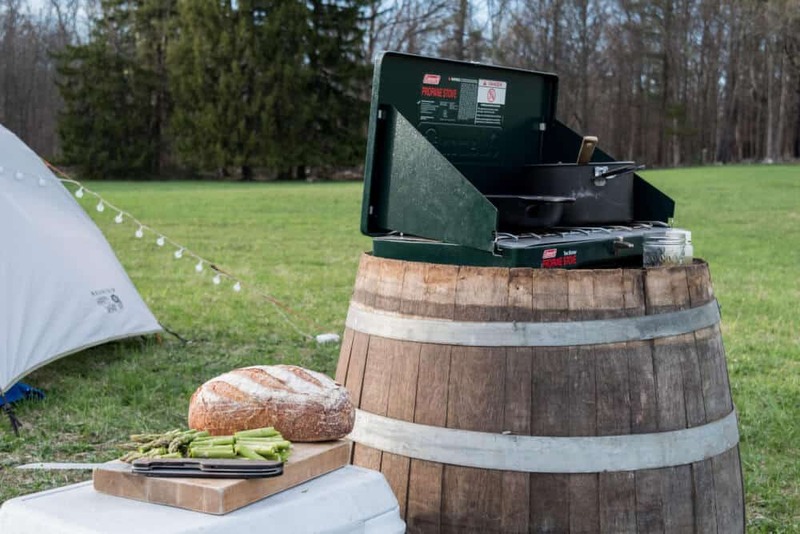 It’s our favorite way to travel for a million reasons, but one that tops the list is that we can cook our own food and eat it outside. Since decking out our portable car camping kitchen, we’ve had the pleasure of impromptu lunches at awesome drive-by picnic spots, afternoon tea on a rocky bluff overlooking the ocean, and amazing candlelight dinners in the shadow of the world’s tallest trees. We wouldn’t change it for the world. 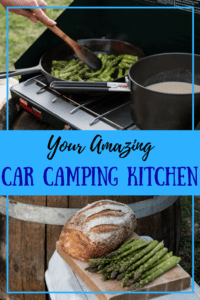 Our car-camping kitchen is easy to set up. It’s taken us years of practice to create the perfect car camping kitchen, but I think we’ve got it down now. Our “kitchen” is actually a big duffel bag that holds all of our cookware and supplies. We have to pack pretty light in order to cram everything into our tiny car. 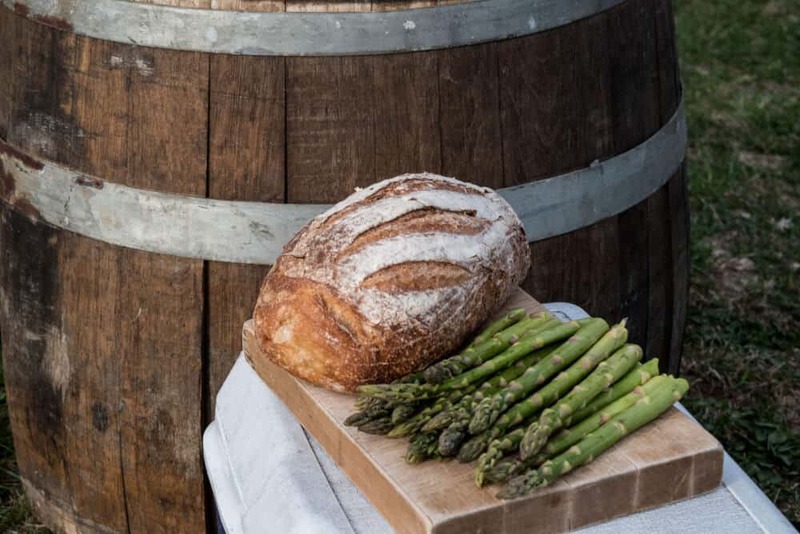 But we also love good camp food and cooking in general, so it’s always a balance. We don’t often cook over a campfire unless we’re camping with a large group. Campfires are awesome, but when camping long-term, they can become a hassle, and expensive if you have to buy firewood. 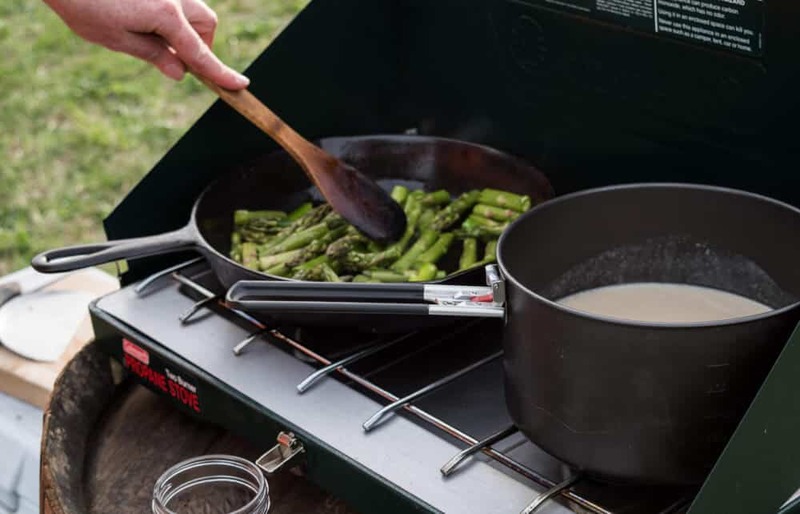 The hub of our car camping kitchen is a 2-burner propane stove that we use for most of our camp meals.
. It’s very light and made for backpacking. The lid has a strainer built in for pasta, plus a removable pot grabber. We have had other sets over the years, but this one is still our favorite. It is an initial investment, but we’ve had ours for more than 10 years, and we still use it every summer. A 12-inch fry pan with a removable handle – We use this frying pan from Primus. It’s a new purchase, but we love it so far. because they can hold soup or solids. They are lightweight, easy to clean and come in different colors. We don’t use sporks or plastic utensils, just regular silverware that we steal from our kitchen. Travel mugs – We love our Contigos, which are available at many outdoor/discount stores. We have one for each member of the family in a different color. They’re totally spill-proof, which means I can throw my tea in my backpack when I head out to watch the sunset after dinner. A small cutting board a chef’s knife – this set from Primus. For Christmas last year, my husband bought me I love it that it wraps up into it’s on little bundle. – We LOVE this knife, which is probably our most coveted item when we’re out camping or picnicking with friends. It’s also our all-time favorite gift for outdoor-loving friends. We take it everywhere and use it for bread and tomatoes. For some reason, it doesn’t get great reviews on Amazon. We bought ours locally and have used it happily for 10+ years. A whisk, rubber spatula, wooden spoons, big serving spoons, and a bench scraper – We don’t have dedicated camp utensils yet. We simply grab everything we need from our kitchen before we head out the door. they’re still making them today. This keeps our eggs safe and dry in the cooler, although we usually keep it in a zip-top bag, just in case. Our super awesome homemade spice kit. Now, the fun begins! 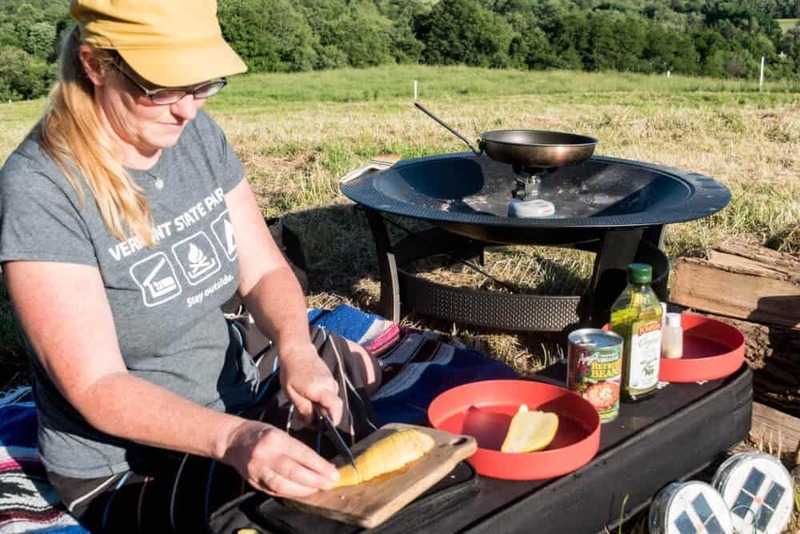 Here are some first-hand tips for making the most of your car camping kitchen. Make sure your cookware serves more than one purpose. We use our plate/bowl hybrids so we can eat pancakes or soup out of them, and we try and buy the lightest cookware we can find so that we can also use it for backpacking. I have to admit, we’re not a big fan of sporks, though. 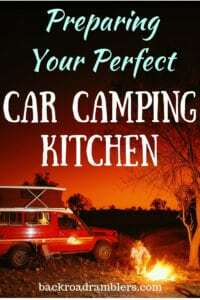 Create a special recipe book for your car camping meals. I know the smartphone revolution is long past, but I still prefer real books when we’re camping (nothing to recharge). We paste our camp recipes in a compact little notebook. We have a handful of favorite recipes that are easy to prepare, delicious to eat, and don’t make a lot of dishes. The notebook lives in the side pocket of our kitchen. Hot beverages are the cat’s meow. Tea, coffee, hot cocoa – whatever makes you happy at home will thrill you when you’re on the road. Generally, we keep things simple, but sometimes we need special hot drinks to pacify the masses. Leave the bacon at home. Obviously, you bacon lovers will keep on keepin’ on, but I’m done. Leaving the bacon behind on camping trips was a hard lesson to learn, but I love not scrubbing greasy bacon pans in the woods. They are nearly impossible to clean, and the fat attracts animals and makes everything smell bad. our favorite seasonings. This is all packed into a zippered bag that we keep in the pantry (plastic bin). worth its weight in gold, and we will never go car camping without it. Don’t forget the finishing touches. A pretty tablecloth, candles, and cloth napkins make every meal feel special, and there is nothing better in the whole world than watching the sun go down in a beautiful place while eating an awesome camp-cooked meal in luxury. Whether we’re relaxing at home or livin’ it up on the road, eating is still one of our family’s favorite pastimes. With every camping trip, we refine our packing, cooking, and organizing skills. 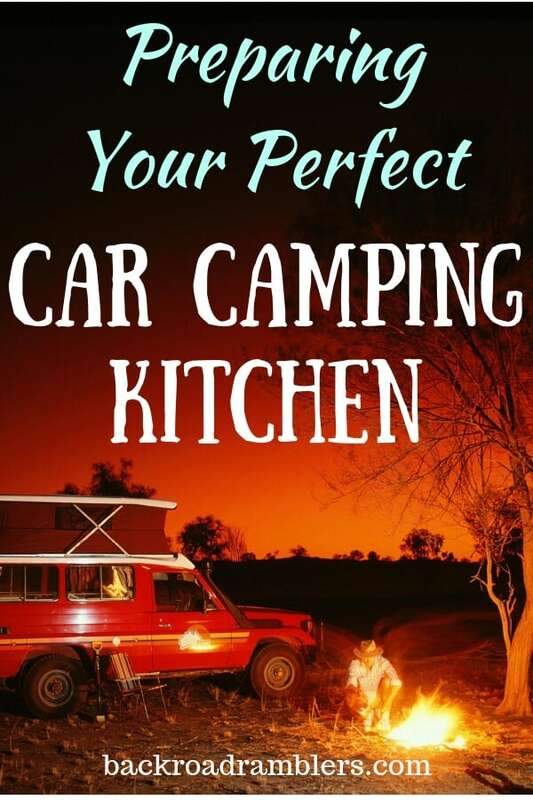 We’d love to hear some of your tips for making the most of your car camping kitchen. Are you on Pinterest? Please share this post! We love to car camp and try to get out a few times a year. I love the idea to pack spices because that is the one thing I always forget! I’m the opposite, Cassie. I think I tend to work more in the winter, which is perfectly fine with me. Terrific tips. We ate grilled cheese on the side of the road in the swiss alps one day. It was beautiful and delicious. Grilled cheese in the Alps sounds delightful, Candy! What a fabulous idea! Wish we had more time to do things like this. Love it! I totally agree with you on the bacon topic. Now if I could get my husband to agree to that….lol! Thanks for the tips. I use sausages, sometimes the precooked ones, though I usually shy away from that stuff… but they aren’t bad.. and the saving grace is lots of paper towel. I simply wipe out my pan before it cools all the way. You make it look so great! I am not a camper, but i love your suggestions!